To travel without going away from home. To dive without getting wet. To see many fishes and marine life without wearing masks. To visit some of planet’s most preserved marine ecosystems. 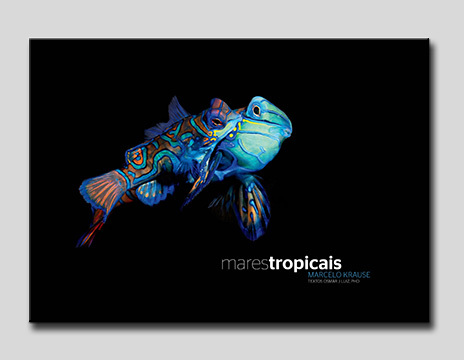 That’s just a small part of what wildlife photographer Marcelo Krause brings to us with his photo book called “Mares Tropicais” – or Tropical Seas. Result of years of research and hard work, Mares Tropicias has 224 pages full of amazing pictures of the animal world beneath tropical waters. Traveling to some of the most remote and preserve places on the planet, Krause has put together an impressive portfolio of underwater scenery and marine life. Among the assortment of pictures showing colorful, endangered and delicate life forms, some of then stand apart. Such as the photo of a whale shark, the world’s largest fish. Or the tiny pigmy pipefish, measuring less than one inch. Rare and beautiful photos that will take your breath away.